This can be a transformative election. Will economic meltdown, race or regional loyalty be the trump card? 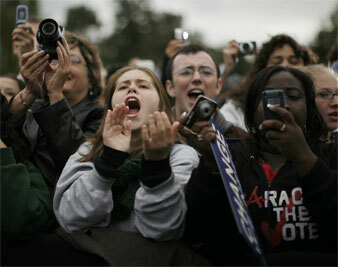 Reuters Pictures Obama supporters in Cleveland. Chalmers Johnson is the author of three linked books on the crises of American imperialism and militarism. They are Blowback (2000), The Sorrows of Empire (2004), and Nemesis: The Last Days of the American Republic (2006). All are available in paperback from Metropolitan Books. This essay originally appeared on TomDispatch. In his acceptance speech at the Democratic National Convention, Barack Obama called the forthcoming presidential election a “defining moment” in this country’s history. It is conceivable that he is right. There are precedents in American history for an election inaugurating a period of reform and political realignment. Such a development, however, is extremely rare and surrounded by contingencies normally beyond the control of the advocates of reform. So let me speculate about whether the 2008 election might set in motion a political reconfiguration–and even a political renaissance–in the United States, restoring a modicum of democracy to the country’s political system, while ending our march toward imperialism, perpetual warfare and bankruptcy that began with the cold war. The political blunders, serious mistakes and governmental failures of the last eight years so discredited the administration of George W. Bush–his average approval rating has fallen to 27 percent and some polls now show him dipping into the low twenties–that his name was barely mentioned in the major speeches at the Republican convention. Even John McCain has chosen to run under the banner of “maverick” as a candidate of “change,” despite the fact that his own party’s misgoverning has elicited those demands for change. Bringing the opposition party to power, however, is not in itself likely to restore the American republic to good working order. It is almost inconceivable that any president could stand up to the overwhelming pressures of the military-industrial complex, as well as the extra-constitutional powers of the sixteen intelligence agencies that make up the US Intelligence Community, and the entrenched interests they represent. The subversive influence of the imperial presidency (and vice presidency), the vast expansion of official secrecy and of the police and spying powers of the state, the institution of a second Defense Department in the form of the Department of Homeland Security and the irrational commitments of American imperialism (761 active military bases in 151 foreign countries as of 2008) will not easily be rolled back by the normal workings of the political system. For even a possibility of that occurring, the vote in November would have to result in a “realigning election,” of which there have been only two during the past century–the election of Franklin Roosevelt in 1932 and of Richard Nixon in 1968. Until 1932, the Republicans had controlled the presidency for fifty-six of the previous seventy-two years, beginning with Abraham Lincoln’s election in 1860. After 1932, the Democrats occupied the White House for twenty-eight of the next thirty-six years. The 1968 election saw the withdrawal of the candidacy of President Lyndon Johnson under the pressure of the Vietnam War, the defeat of his vice president, Hubert Humphrey, not to mention the assassinations of Robert Kennedy and Martin Luther King. That election, based on Nixon’s so-called Southern strategy, led to a new political alignment nationally, favoring the Republicans. The essence of that realignment lay in the running of Republican racists for office in the old Confederate states where the Democrats had long been the party of choice. Before 1968, the Democrats had also been the majority party nationally, winning seven of the previous nine presidential elections. The Republicans won seven of the next ten between 1968 and 2004. However, the founders of this country and virtually all subsequent political leaders have been hostile to democracy in this sense. They favored checks and balances, republicanism and rule by elites rather than rule by the common man or woman. Wolin writes, “The American political system was not born a democracy, but born with a bias against democracy. It was constructed by those who were either skeptical about democracy or hostile to it. Democratic advance proved to be slow, uphill, forever incomplete. The republic existed for three-quarters of a century before formal slavery was ended; another hundred years before black Americans were assured of their voting rights. Only in the twentieth century were women guaranteed the vote and trade unions the right to bargain collectively. In none of these instances has victory been complete: women still lack full equality, racism persists, and the destruction of the remnants of trade unions remains a goal of corporate strategies. Far from being innate, democracy in America has gone against the grain, against the very forms by which the political and economic power of the country has been and continues to be ordered. Franklin Roosevelt’s New Deal introduced a brief period of approximate democracy. This ended with the US entry into World War II, when the New Deal was replaced by a wartime economy based on munitions manufacture and the support of weapons producers. This development had a powerful effect on the American political psyche, since only war production ultimately overcame the conditions of the Great Depression and restored full employment. Ever since that time, the United States has experimented with maintaining a military economy and a civilian economy simultaneously. Over time, this has had the effect of misallocating vital resources away from investment and consumption, while sapping the country’s international competitiveness. Socioeconomic conditions in 2008 bear a certain resemblance to those of 1932, making a realigning election conceivable. Unemployment in 1932 was a record 33 percent. In the fall of 2008, the rate is a much lower 6.1 percent, but other severe economic pressures abound. These include massive mortgage foreclosures, bank and investment house failures, rapid inflation in the prices of food and fuel, the failure of the health care system to deliver service to all citizens, a growing global-warming environmental catastrophe due to the over-consumption of fossil fuels, continuing costly military interventions in Iraq and Afghanistan, with more on the horizon due to foreign policy failures (in Georgia, Ukraine, Palestine, Lebanon, Iran, Pakistan, and elsewhere), and record-setting budgetary and trade deficits. The question is: Can the electorate be mobilized, as in 1932, and will this indeed lead to a realigning election? The answer to neither question is an unambiguous yes. Even to contemplate that happening, of course, the Democratic Party first has to win the election–and in smashing style–and it faces two formidable obstacles to doing so: race and regionalism. The term refers to Tom Bradley, a former black mayor of Los Angeles, who lost his 1982 bid to become governor of California, even though every poll in the state showed him leading his white opponent by substantial margins. Similar results appeared in 1989, when David Dinkins ran for mayor of New York City and Douglas Wilder sought election as governor of Virginia. Dinkins was ahead by 18 percentage points, but won by only two, and Wilder was leading by nine points, but squeaked through by only half a percent. Numerous other examples lead Hacker to offer this advice to Obama campaign offices: always subtract 7 percent from favorable poll results. That’s the potential Bradley effect. Meanwhile, the Karl Rove-trained Republican Party has been hard at work disenfranchising black voters. Although we are finally beyond property qualifications, written tests and the poll tax, there are many new gimmicks. These include laws requiring voters to present official identity cards that include a photo, which, for all practical purposes, means either a driver’s license or a passport. Many states drop men and women from the voting rolls who have been convicted of a felony but have fully completed their sentences, or require elaborate procedures for those who have been in prison–where, Hacker points out, black men and women outnumber whites by nearly six to one–to be reinstated. There are many other ways of disqualifying black voters, not the least of which is imprisonment itself. After all, the United States imprisons a greater proportion of its population than any other country on Earth, a burden that falls disproportionately on African-Americans. Such obstacles can be overcome, but they require heroic organizational efforts. The five regions Earl and Merle Black identify–each becoming more partisan and less characteristic of the nation as a whole–are the Northeast, South, Midwest, Mountains/Plains and Pacific Coast. The Northeast, although declining slightly in population, has become unambiguously liberal Democratic. It is composed of New England (Connecticut, Maine, Massachusetts, New Hampshire, Rhode Island and Vermont), the Middle Atlantic states (Delaware, Maryland, New Jersey, New York, and Pennsylvania) and the District of Columbia. It is the primary Democratic stronghold. The South is today a Republican stronghold made up of the eleven former Confederate states (Alabama, Arkansas, Florida, Georgia, Louisiana, Mississippi, North Carolina, South Carolina, Tennessee, Texas and Virginia). A second Republican stronghold, displaying an intense and growing partisanship, is the Mountains/Plains region, composed of the thirteen states of Arizona, Colorado, Idaho, Kansas, Montana, Nebraska, Nevada, New Mexico, North Dakota, Oklahoma, South Dakota, Utah and Wyoming. A second Democratic stronghold is the Pacific Coast, which includes the nation’s most populous state, California, joined by Alaska, Hawaii, Oregon and Washington. The Midwest, where national elections are won or lost by the party able to hold onto, and mobilize, its strongholds, is composed of Illinois, Indiana, Iowa, Kentucky, Michigan, Minnesota, Missouri, Ohio, West Virginia and Wisconsin. The two most important swing states in the nation are Florida (27 electoral votes) and Ohio (20 electoral votes), which the Democrats narrowly lost, generally under contested circumstances, in both 2000 and 2004. These five regions are today entrenched in the nation’s psyche. Normally, they ensure very narrow victories by one party or another in national elections. There is no way to get around them, barring a clear and unmistakable performance failure by one of the parties–as happened to the Republicans during the Great Depression and may be happening again. Beyond these negatives, in 2008 there have been a number of developments that speak to the possibility of a turning-point election. First, the weakness (and age) of the Republican candidate may perhaps indicate that the Party itself is truly at the end of a forty-year cycle of power. Second, of course, is the meltdown, even possibly implosion, of the US economy on the Republican watch (specifically, on that of George W. Bush, the least popular president in memory, as measured by recent opinion polls). This has put states in the Midwest and elsewhere that Bush took in 2000 and 2004 into play. Third, there has been a noticeable trend in shifting party affiliations in which the Democrats are gaining membership as the Republicans are losing it, especially in key battleground states like Pennsylvania where, in 2008 alone, 474,000 new names have gone on the Democratic rolls, according to the Washington Post, even as the Republicans have lost 38,000. Overall, since 2006, the Democrats have gained at least 2 million new members, while the Republicans have lost 344,000. According to the Gallup organization, self-identified Democrats outnumbered self-identified Republicans by a 37 percent to 28 percent margin this June, a gap which may only be widening. Fourth, there is the possibility of a flood of new, especially young, first-time voters, who either screen calls or live on cell phones, not landlines, and so are being under-measured by pollsters, as black voters may also be in this election. (However, when it comes to the young vote, which has been ballyhooed in a number of recent elections without turning out to be significant on Election Day, we must be cautious.) And fifth, an influx of new Democratic voters in states like Virginia, Colorado and New Mexico threatens, in this election at least, to dent somewhat the normal regional loyalty patterns described by Earl and Merle Black. Above all, two main issues will determine whether or not the November election will be a realigning one. The Republican Party’s failure in managing the economy, its involving the country in catastrophic wars of choice and its ignoring such paramount issues as global warming all dictate a Democratic victory. Militating against that outcome is racist hostility, conscious or otherwise, toward the Democratic Party’s candidate as well as deep-seated regional loyalties. While the crisis caused by the performance failures of the incumbent party seems to guarantee a realigning election favoring the Democrats, it is simply impossible to determine the degree to which race and regionalism may sway voters. The fate of the nation hangs in the balance.